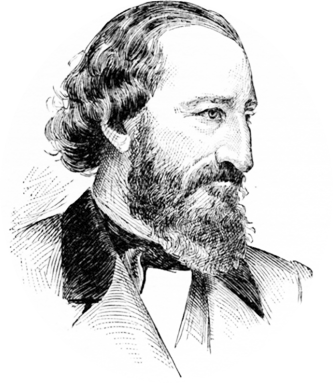 George Phineas Gordon (see biography of George Phineas Gordon) was a famous American inventor (with more than 50 patents on his name), printer and businessman, who developed the basic design of the most common printing press ever, the Gordon Letterpress. At the end of his life, in 1870s, he was obviously so wealthy, that decided to produce an adding device, to keep accounts of his money :-). 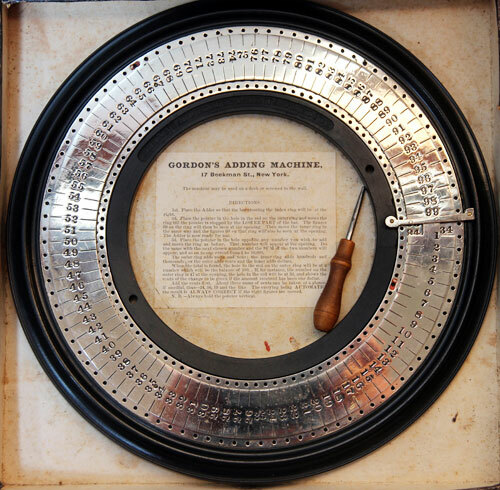 The adding machine of Gordon, similar to several earlier devices (like these of House, Taylor, Holman, and others), was in production in late 1870s, as more than 30 machines were produced. The adding device of Gordon is a stylus operated circular adder with capacity up to 9999. It measures approximately 23 cm in diameter with a very early bakelite and thermoplastic base with heavy nickel plated top mechanism. The machine may be used on a desk or screwed to the wall. Let's see the operation of the device, using the directions, printed on the box (see the lower image). 1. Place the adder so that the bar crossing the index ring will be at the right. 2. Place the pointer in the hole in the red on the outer ring and move the ring till the pointer is stopped by the LOWER PART of the bar. The figures 00 on the ring will then be seen at the opening. Then move the inner ring in the same way and the figures 00 on that ring will also be seen at the opening. The adder is now ready for use. 3. Place the pointer in the hole opposite any number you wish to add and move the ring as before. That number will appear at the opening. Do the same with the next chosen number and the SUM of the two numbers will appear, and so on to any extent from 1 to 10000. The outer ring adds units and tens; the inner ring adds hundreds and thousands; or the outer adds cents and the inner adds dollars. When the total is found, the hole in the red on the outer ring will be at a a number which will be the balance of 100. If, for instance, the number on the outer ring is 47 at the opening, the hole in the red will be at 53, and shows the cents of the change to be given if the amount received has been one dollar. Add the cents first. About three sums of cents can be taken at a glance. If needful, thus—24, 36, 19 and the like. The carrying being AUTOMATIC, the result is ALWAYS CORRECT if the right figures are moved. Note: Always hold the pointer vertical.